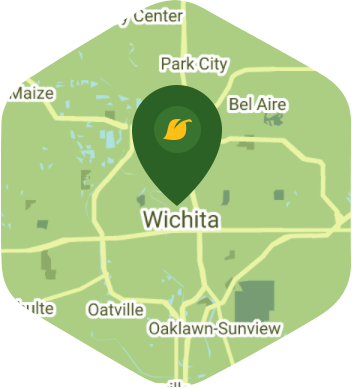 Book a skilled leaf removal expert in Wichita. Backed by a total satisfaction guarantee and amazing customer support. Wichita is a city that shows there is more to the state of Kansas than just cows and farms. It is a city with plenty of culture and outdoor attractions that help make it one of the best places to live in. It has museums and parks that are great places to visit during your free time. Whenever you get the time to relax after a long day at work, the last thing on your mind is doing leaf removal at your garden. Leaves tend to shed fast from trees during the autumn season and it is no different here in Wichita. This lasts for several weeks a year and the leaves that fall from the trees on your property can suffocate the grass. This doesn't have to be the case as long as Lawn Love is around. We are pros at leaf removal and with our help your yard will be clear of leaves in no time at all. Our independent lawn pros have worked in yards of all sizes, so they should have no problem doing leaf removal on your property. If you feel like your yard could benefit from our leaf removal service, then feel free to ask for a free online quote from our site or by calling us at 316-218-9454. Dusk and dawn are the best times to water your lawn (the sun will rise at 6:44 AM and set at 8:12 PM today in Wichita).